As part of our most recent release, we’ve added support for the LEF file format, allowing you to upload the transcript text, video sync information, exhibits and related transcript text in a single package. Since this is just one of the many formats that we already support, importing LEF files is the same simple deposition import process you’re used to. A big component of LEF support is the ability to link deposition text to an exhibit, allowing you to quickly navigate from the deposition to the relevant exhibit. 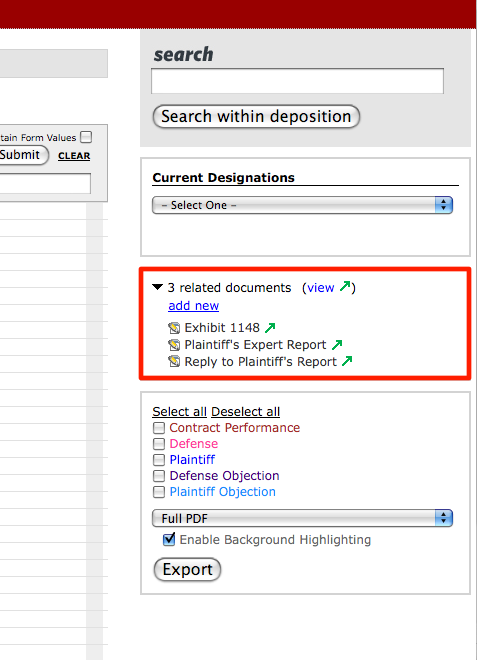 You’ll see the related exhibits on the right hand side of the deposition editor. Once the text has been linked up, you’ll see that the specified text in the deposition is now a link and will open the related exhibit in a new window. In the situations where multiple exhibits relate to the same text, you’ll see a drop down box with all of the related exhibits for that snippet of deposition text. We’re also giving you the option to edit the related exhibit. 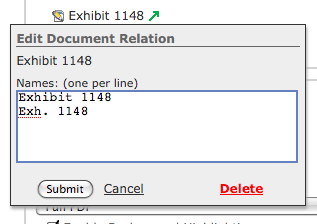 You can specify one or more snippets of text to link the exhibit, as well as delete the relationship itself. As it was before, relating an exhibit to a deposition is done by choosing the related deponent from the document editor rather than just relating the deposition to the exhibit. We felt this was the right relationship here, as depositions themselves may be a series of volumes for a single deponent, which will be associated with the same set of exhibits. So, whether you’re looking for LEF support, or a simple way of linking exhibits to deposition text, this feature should take care of exactly what you need. Recently we’ve been focusing on improving the process of reviewing documents in the Nextpoint web application. A core part of that process is reading the documents themselves, so we’ve been working on some big improvements to that experience. We’ve always had preview images of documents to allow for quick viewing and searching within the browser and to avoid having to download documents for viewing in native applications or plug-ins. They’ve been a big hit with our users. 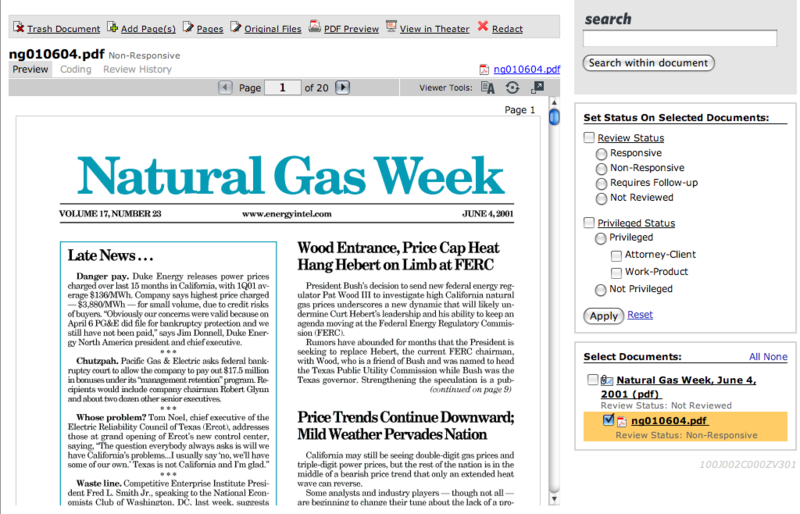 With our newest release we’re taking our browsing experience to the next level. The document preview now supports scrolling through pages just like Word or Acrobat, and you can now switch to full-screen “zoom” mode for an ideal reading experience. One big benefit of scrolling through documents is speed. There is no waiting for pages to load individually, because they preload while you’re reading the previous page(s) and are ready by the time you scroll down to them. It’s more convenient and natural to read by scrolling down as well, since it removes the disconnect between pages. We’ve ensured that these new features don’t slow down your existing work-flow, such as navigating between documents, by avoiding unnecessary preloading of other pages. For example, if you quickly jump to another section of the document, we won’t waste resources loading all the pages in-between. The other important aspect of the reading experience is size. A few months ago we increased the size of our web preview images by about 50%, which especially helps when reading documents with small fonts or poorly scanned images. This new release includes a full-screen “zoom” mode, however, which takes advantage of our Theater presentation-mode technology to show larger document previews on the fly. Just click the zoom button, and the preview will fill your browser. As with the non-zoomed version, we preload nearby pages so the high quality versions will already be in place as they come on-screen while you read and scroll. To help ensure performance, we do limit the maximum size of these images (unfortunately they won’t completely fill your 30″ cinema display monitor), but if you need to zoom in on certain details, don’t forget that Theater is always available. Like in the past, you can also switch to viewing the extracted text or OCR and users with Advanced permissions can also edit. A couple particularly slick features are that we remember which page you were scrolled to even when you click the “refresh” button in your browser, so you won’t lose your place when you reload to see updates from other users or processing jobs. And when you’re jumping between related documents in the Review screen, we keep each document’s preview hidden in the background, so you don’t have to wait for the preview images to reload when you switch back to a document you were previously reading. 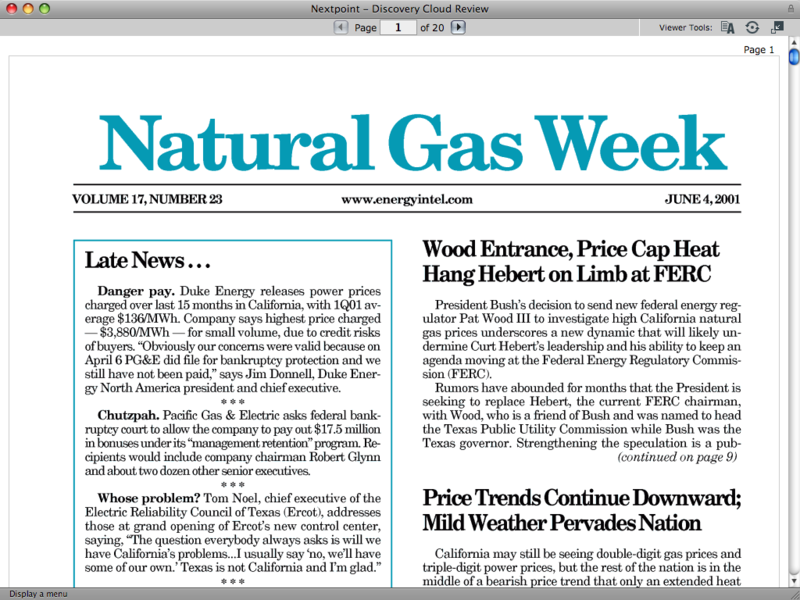 We hope you enjoy the new and improved document reader in Nextpoint. It’ll be available for all accounts as of February 18th, 2010. 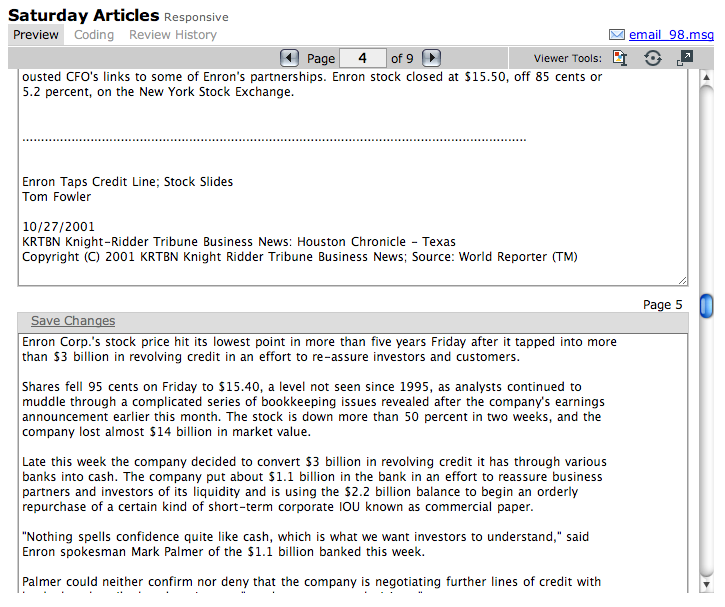 The news filtering back to us from LegalTech (#ltny on Twitter) is “Cloud”s the word. As you’d imagine, for a company committed to bringing uncapped storage and processing to the legal industry, it’s music to our ears. Only trouble is, we’re a little worried that there are a lot of folks out there still trying to nail down what exactly “Cloud” means. We tend to agree with a lot of the NIST definition of “Cloud Computing”. Let’s take a look at their 5 Essential Characteristics. We take this one step further, handling the launching and monitoring of resources for you. A large-scale action on your part, results in new servers launching to take care of the heavy lifting with maximum efficiency. You can access your data from anywhere an internet connection is available. Be it via a traditional browser or by phone. Our data is stored in some of the most reputable data centers in the world. Capabilities can be rapidly and elastically provisioned, in some cases automatically, to quickly scale out and rapidly released to quickly scale in. To the consumer, the capabilities available for provisioning often appear to be unlimited and can be purchased in any quantity at any time. With Nextpoint, you have uncapped access to storage and processing power. Uploading large amounts of data will result in a large number of servers starting up to store your documents, index them for search, create preview images for the web and presentation, etc. Cloud systems automatically control and optimize resource use by leveraging a metering capability at some level of abstraction appropriate to the type of service (e.g., storage, processing, bandwidth, and active user accounts). Resource usage can be monitored, controlled, and reported providing transparency for both the provider and consumer of the utilized service.